Automatically add sample products, promo items, discounts and more to your customer's order to drive return sales and deepen customer relationships. Try Edit Order Standard Plus Plan for FREE* and start automating today. *Edit Order with Shopify Flow is available only to Shopify Plus merchants using Edit Order’s new Standard Plus plan for $49 per month plus 45-day free trial. When an order is received with that is over $100.00 in price, automatically add an item to the order. When any order is received, automatically add an item to the order. We have more triggers and actions on the horizon. 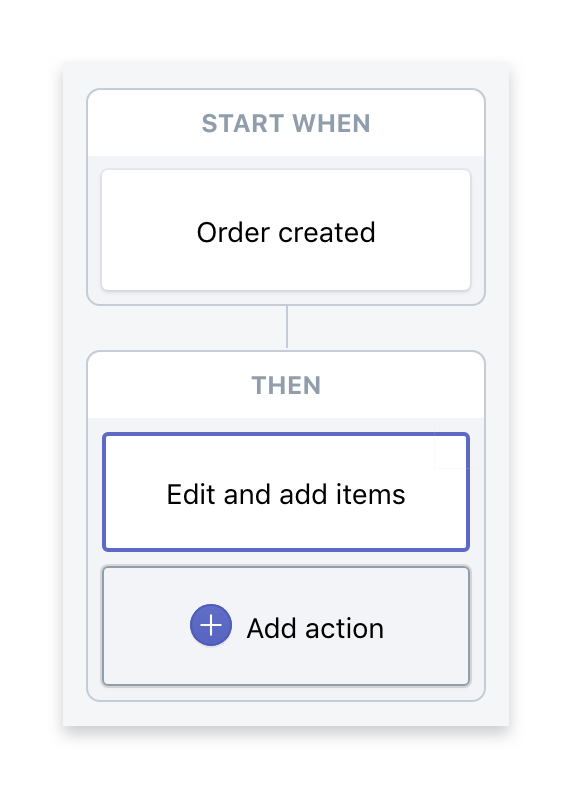 Soon you’ll be able automate adding line items to a draft order, adding conditions on draft order update, add conditions on editing of an order, and much more. Need more details on automation? Learn more about automating your Shopify Plus store with Shopify Flow connectors for Edit Order.